Create a password that is at least 8 characters long (a longer password is better). Use a combination of numbers, letters and special characters to make your password more secure. Yes, I'd like to receive the Arvig blog and product updates. Call 888.992.7844 if you have any questions. Or, chat with us online at arvig.net. These Terms of Service shall apply to your use of the all web-based single sign-on services (arvig.net, my.arvig.com, etc.) provided by Arvig (“Arvig” and the “Service”). These Terms of Service represent the parties’ entire understanding regarding the Service and shall control over any different or additional terms of any purchase or other non-Arvig ordering document. Arvig reserves the right to update and change these Terms of Service from time to time without notice. Any new features that augment or enhance the current Service, including the release of new tools and resources, shall be subject to these Terms of Service. Continued use of the Service after any such changes shall constitute your consent to such changes. Subject to the terms and conditions of these Terms of Service, for so long as you have an active account for the Service, Arvig hereby grants you the limited, non-exclusive, non-transferable, non-sublicensable right to access and use the Service solely for your internal business operations. You will be responsible for maintaining the security of your equipment and account-access passwords, and will use reasonable efforts to prevent any unauthorized use of the Service and immediately notify Arvig in writing of any unauthorized use that comes to your attention. If there is unauthorized use by anyone who obtained access to the Service directly or indirectly through you, you will take all steps reasonably necessary to terminate the unauthorized use. You will be responsible and liable for all activity conducted through your users’ accounts. You will cooperate and assist with any actions taken by Arvig to prevent or terminate unauthorized use of the Service. A valid credit card and/or billing address is required for paying accounts. The Service is billed in advance on a monthly basis. All fees are exclusive of all taxes and fees by taxing authorities and you shall be responsible for payment of all such taxes and fees. If payment of any fees is not made when due and payable, a late fee will accrue at the rate of the lesser of one and one-half percent (1.5%) per month or the highest legal rate permitted by law. Downgrading your account may cause loss of content, features or capacity. Arvig does not accept liability for such loss. Arvig reserves the right at any time and from time to time to modify or discontinue, temporarily or permanently, the Service (or any part thereof) with or without notice. Prices of all Services are subject to change upon thirty-day notice from us. Such notice may be provided at any time by posting the changes to the Arvig website (arvig.com and arvig.net), bill message or the Service itself. Arvig shall not be liable to you or to any third party for any modification, price change, suspension or discontinuance of the Service. 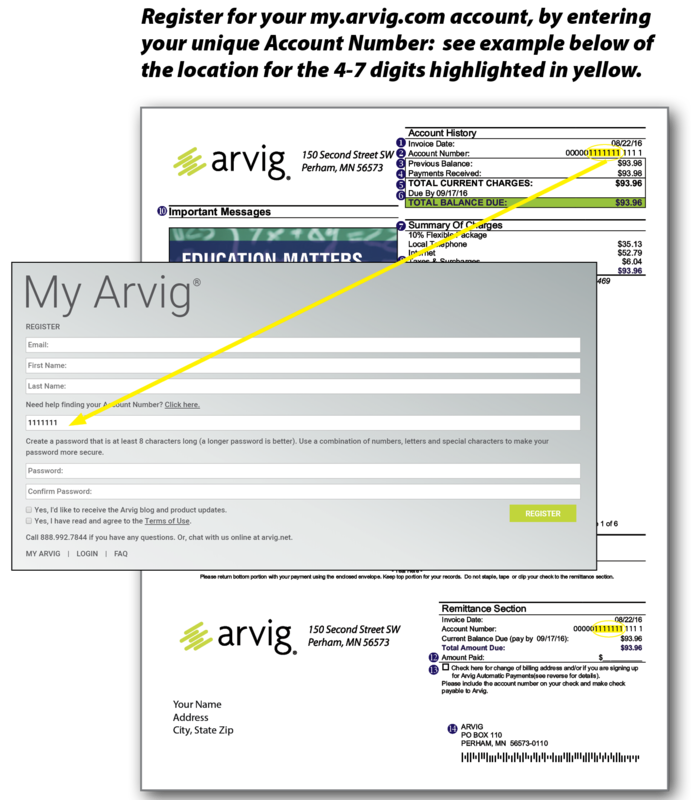 When you create an account with Arvig, you must provide Arvig information that is accurate, complete and current at all times. Failure to do so constitutes a breach of the Terms of Service, which may result in immediate termination of your account on the Service. You will not, and will not permit or authorize third parties to (a) rent, lease or otherwise permit third parties to use the Service; (b) use the Service to provide services to third parties (e.g., as a service bureau); (c) breach, circumvent, tamper with or disable any security or other technological features or measures of the Service; (d) attempt to probe, scan or test the vulnerability of any systems related to the Service, including penetration or load tests; or (e) attempt to discover the underlying structure, technology or algorithms of the Service. The Service and any related software is subject to applicable export control laws and regulations. You agree to comply strictly with all such laws and regulations as they relate to the Service and such software, and, to the extent consistent with this Agreement, to obtain any necessary license or other authorization to export, reexport, or transfer the Service or such software when required. You agree to use the Service in compliance with all other applicable laws and to indemnify and hold Arvig and its affiliates and their officers, employees, directors and agents harmless from any from any and all losses, damages, expenses, including reasonable attorneys’ fees, rights, claims and actions of any kind arising out of or relating to your use of the Service or your violation of these Terms of Service. You will not have any rights to the Service except as expressly granted in this Agreement. Arvig reserves to itself all rights to the Service not expressly granted to you in accordance with these Terms of Service. If you provide any feedback to Arvig concerning the functionality and performance of the Service (including identifying potential errors and improvements), you hereby assign to Arvig all right, title, and interest in and to the feedback, and Arvig is free to use the feedback without payment or restriction. You are solely responsible for properly canceling your account. You can cancel your account at any time via view.arvig.com. Arvig, in its sole discretion, has the right to suspend or terminate your account and refuse any and all current or future use of the Service for any reason at any time, including your active or passive attempts at disrupting the Services or disrupting the use of the Service by others. Such termination of the Service will result in the suspension or deletion of your Account or your access to your Account. Arvig reserves the right to refuse service to anyone for any reason at any time. THE SERVICE IS PROVIDED ON AN “AS-IS” BASIS AND ARVIG DISCLAIMS ANY REPRESENTATION OR WARRANTY OF ANY KIND, WHETHER EXPRESS, IMPLIED (EITHER IN FACT OR BY OPERATION OF LAW), OR STATUTORY, AS TO ANY MATTER WHATSOEVER. ARVIG EXPRESSLY DISCLAIMS ALL IMPLIED WARRANTIES OF MERCHANTABILITY, FITNESS FOR A PARTICULAR PURPOSE, QUALITY, ACCURACY, TITLE, AND NON-INFRINGEMENT. ARVIG DOES NOT WARRANT THAT THE SERVICE IS ERROR-FREE OR THAT OPERATION OF THE SERVICE WILL BE SECURE OR UNINTERRUPTED. TO THE MAXIMUM EXTENT PERMITTED BY APPLICABLE LAW, IN NO EVENT SHALL ARVIG, ITS AFFILIATES, DIRECTORS, EMPLOYEES OR ITS LICENSORS BE LIABLE FOR (A) ANY INDIRECT, PUNITIVE, INCIDENTAL, SPECIAL, CONSEQUENTIAL OR EXEMPLARY DAMAGES, INCLUDING WITHOUT LIMITATION DAMAGES FOR LOSS OF PROFITS, GOODWILL, USE, DATA OR BUSINESS OR OTHER INTANGIBLE LOSSES, OR THE COST OF PROCUREMENT OF SUBSTITUTE GOODS, SERVICE OR TECHNOLOGY, (B) ANY MATTER BEYOND ITS REASONABLE CONTROL OR (C) ANY AMOUNTS THAT EXCEED THE FEES PAID BY YOU FOR THE SERVICE IN THE PRECEDING 12 MONTHS. WITHOUT LIMITING THE FOREGOING, UNDER NO CIRCUMSTANCES WILL ARVIG BE RESPONSIBLE FOR ANY DAMAGE, LOSS OR INJURY RESULTING FROM HACKING, TAMPERING OR OTHER UNAUTHORIZED ACCESS OR USE OF THE SERVICE OR YOUR ACCOUNT OR THE INFORMATION OR CONTENT CONTAINED THEREIN. TO THE MAXIMUM EXTENT PERMITTED BY APPLICABLE LAW, ARVIG ASSUMES NO LIABILITY OR RESPONSIBILITY FOR ANY (I) ERRORS, MISTAKES, OR INACCURACIES OF CONTENT; (II) PERSONAL INJURY OR PROPERTY DAMAGE, OF ANY NATURE WHATSOEVER, RESULTING FROM YOUR ACCESS TO AND USE OF OUR SERVICE; (III) ANY UNAUTHORIZED ACCESS TO OR USE OF OUR SECURE SERVERS AND/OR ANY AND ALL PERSONAL INFORMATION STORED THEREIN; (IV) ANY INTERRUPTION OR CESSATION OF TRANSMISSION TO OR FROM THE SERVICE; (V) ANY BUGS, VIRUSES, TROJAN HORSES, OR THE LIKE THAT MAY BE TRANSMITTED TO OR THROUGH OUR SERVICE BY ANY THIRD PARTY; (VI) ANY ERRORS OR OMISSIONS IN ANY CONTENT OR FOR ANY LOSS OR DAMAGE INCURRED AS A RESULT OF THE USE OF ANY CONTENT POSTED, EMAILED, TRANSMITTED, OR OTHERWISE MADE AVAILABLE THROUGH THE SERVICE; AND/OR (VII) USER CONTENT OR THE DEFAMATORY, OFFENSIVE, OR ILLEGAL CONDUCT OF ANY THIRD PARTY. THIS LIMITATION OF LIABILITY SECTION APPLIES WHETHER THE ALLEGED LIABILITY IS BASED ON CONTRACT, TORT, NEGLIGENCE, STRICT LIABILITY, OR ANY OTHER BASIS, EVEN IF ARVIG HAS BEEN ADVISED OF THE POSSIBILITY OF SUCH DAMAGE. THE FOREGOING LIMITATION OF LIABILITY SHALL APPLY TO THE FULLEST EXTENT PERMITTED BY LAW IN THE APPLICABLE JURISDICTION. Arvig provides connectors that interact with third-party applications whose vendors Arvig may or may not have a commercial or contractual relationship with. Arvig continuously monitors the working condition of these connectors and is committed to resolving any issues that may arise from a vendor changing the login procedure of its application. You understand that Arvig is not liable and cannot be held responsible for any changes in third-party applications and interoperability can be broken temporarily or permanently. Furthermore, Arvig has no commitments to ensuring the working condition of any custom connectors built by you. We have implemented commercially reasonable technical and organizational measures designed to secure your personal information and content from accidental loss and from unauthorized access, use, alteration or disclosure. However, we cannot guarantee that unauthorized third parties will never be able to defeat those measures or use your personal information and content for improper purposes. You acknowledge that you provide your personal information at your own risk. This Agreement, and any rights and licenses granted hereunder, may not be transferred or assigned by you, but may be assigned by Arvig without restriction. These Terms of Service shall be governed by the laws of the State of Minnesota without regard to the principles of conflicts of law. You hereby expressly agree to submit to the exclusive personal jurisdiction of the federal and state courts located in Perham, Minnesota, for the purpose of resolving any dispute relating to your access to or use of the Service.